50 The PCB Design Magazine • July 2015 ment for smaller and faster technology. PCB design bureaus are also able to step in during periods of high turnover, multiple proj- ects or periods of staff absence, holidays or during interim periods between full time staff. Whatever the reason behind considering PCB outsourcing, the reasons are neither new nor insurmountable. PCB design bureaus are accus- tomed to working to tight deadlines and fulfill- ing the required project specifications catering to a range of industries and criteria. 2. Hello, is it PCB you're Looking For? First thing to understand is exactly where the sticking point lies, and what elements you actually need to consider outsourcing. Is it schematic entry and library work, com- ponent placement, track rout- ing or is it the complete end- to-end process from design through to manufacture and testing? When considering out- sourcing it is important to consider how much work is required and the process. The five stages of design are: initial design review and integration; mechanical definition; place- ment and review; routing; and pre-delivery and review. All are all critical to the success of the job and these stages need to be understood by you and your PCB de- signer/bureau so that timescales, costs and de- sign time can be factored in. Getting a full understanding of the proj- ect and work required before outsourcing your project is vital and often ensures that the work can be carried out more efficiently. There are some great articles out there about this that can help you understand more about the design process and range of reputable design bureaus that are happy to answer any queries or con- cerns you may have. Make sure the process al- lows for your input every step of the way. Many larger organisations use screen-sharing options that allow you to gain a full understanding of the work being undertaken as the project devel- ops. It also enables you to view your live design on screen so that you can have the appropriate discussions to move your design forward. 3. Fail to Prepare or Prepare to Fail Data preparation and library management are time-consuming activities, but is a crucial part of the process and if not done correctly it can severely impair the success of the project. From the inclusion of library parts to the colla- tion of data sheets for each item, the importance of appropriate data preparation and library manage- ment cannot be overstated. Some PCB design bureaus will offer this service, but some won't so it's important to understand what is required before work commences. Some companies will expect full CAD-generated schemat- ics, but many can also work from hand-drawn sketches, if required. This initial planning plays a very important part es- pecially when it comes to com- municating your plans. This can create added complexities when locating appropriate ele- ments and parts for the design. 4. 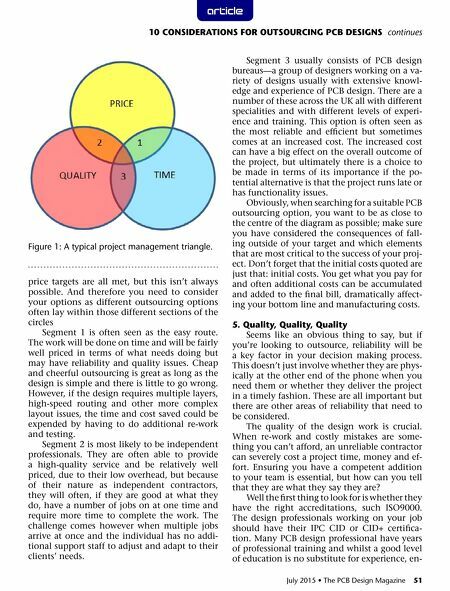 The Project Management Triangle Never heard of it? Neither have many peo- ple. 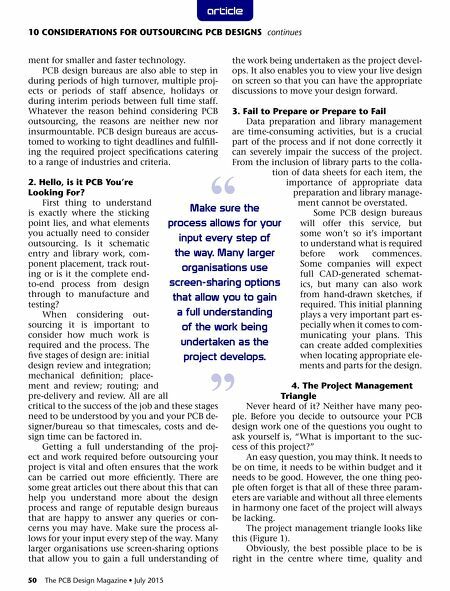 Before you decide to outsource your PCB design work one of the questions you ought to ask yourself is, "What is important to the suc- cess of this project?" An easy question, you may think. It needs to be on time, it needs to be within budget and it needs to be good. However, the one thing peo- ple often forget is that all of these three param- eters are variable and without all three elements in harmony one facet of the project will always be lacking. The project management triangle looks like this (Figure 1). Obviously, the best possible place to be is right in the centre where time, quality and 10 CONSIDERATIONS FOR OUTSOURCING PCB DESIGNS continues article Make sure the process allows for your input every step of the way. Many larger organisations use screen-sharing options that allow you to gain a full understanding of the work being undertaken as the project develops. " "